Now we move our focus to Ireland, the United Kingdom, and the nations of Scandinavia, where the reality of the fantastic realm of Aysle holds sway. Just a general note before we begin. The products being previewed are still in the finishing stages of editing and development so there may be some typos and changes before we release the final product. 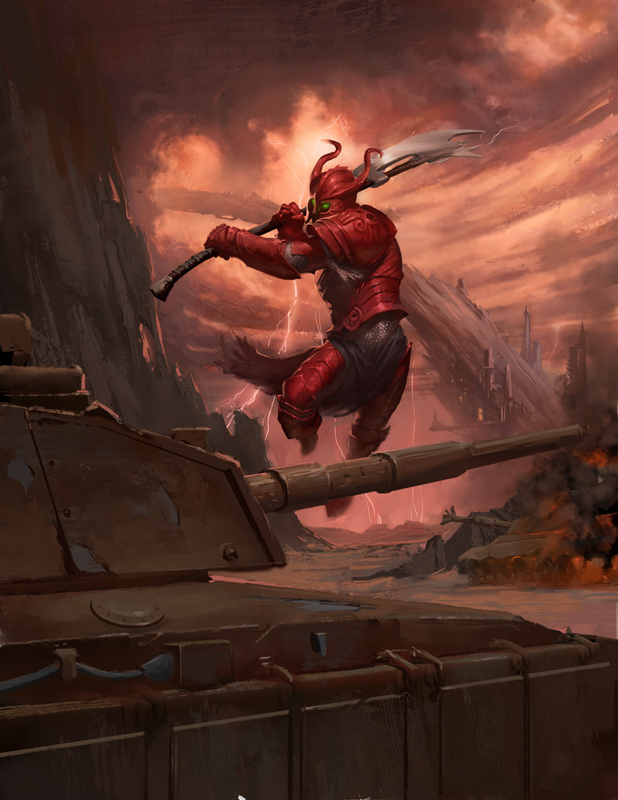 The Torg Eternity core book describes the world as it stands at the end of the third month of the war. Each of the cosm sourcebooks will detail what happens over the following nine months. The High Lords have been busy, but the Delphi Council is trying to push back. With regards to Aysle they’re holding the line. Barely. Aysle is a realm that will feel familiar to most gamers, one that features powerful wizards, brave warriors, faithful clerics, and…yes, dragons. There’s no question that Aysle leans heavily on the tropes of classic fantasy roleplaying games, but leans heavily on legends. Not only do the stories and myths of the British Isles and northern Europe feature strongly, but those legends entwine themselves with the very reality of Aysle, and great rewards are bestowed on those who complete quests…for Light or Dark. Out of all the invading cosms, Aysle by far has the highest Magic Axiom. Magic has nearly completely supplanted technology, to the point that nearly anything technology can do, there is a spell or magic item in Aysle that is capable of the same. However while magic is ubiquitous, the masses are only capable of casting cantrips, or make basic potions. True spellcasting has long been the realm of the nobility and upper classes, those not with just skill, but money and power to become educated in the ways of the arcane arts. However, this is changing with the influence of those from Core Earth. Aysle’s society is literally medieval, with the people believing in duty, not just to their family, liege, or their faith, but also as a code of conduct. Etiquette is important, and the lower classes demure to the higher ones. It was only relatively recently, with the wars against the Dark One, that the idea of class mobility developed as peasant heroes rose from the masses to defeat evil monsters and cruel creatures. However, with the invasion of Core Earth, the full capability of the Social Axiom is being realized, and rebellion is fermenting. Those who transformed in the realm are often the first to question authority, especially how the gifts of magic are hoarded by nobles and wizards. The power of the gods used to be stronger, before the coming of Uthorion. He was responsible for pushing the development of magic and supplanting the gods. However, while their power is diminished, it still is of among the strongest of the invading realms. Finally, technology is stuck firmly in a state similar to Earth in the 14th century. Magic and miracles provide what technology cannot, and so there is little incentive to develop and push the Tech Axiom. Only the dwarves, especially since the schism between that folk and the gods, attempted to advance technologically. Aysle’s Law of Magic, Law of Light and Darkness, and Law of Enchantment are detailed in the Torg Eternity Corebook. However, just like the Living Land and the Nile Empire, Aysle has a few Minor World Laws as well. Law of Delving: Magic has been around Aysle for thousands of years, and there is a ritual for nearly any desired effect. Getting that effect takes some research, but this subset of the Law of Magic allows a wizard to alter already published spells or possibly invent new or more powerful spells. But care must be taken, for new discoveries ripple through the reality that Uthorion’s Darkness Device can detect—and add to its own repertoire. Law of Heroes: Associated with the Law of Light and Darkness, heroes (and villains) in Aysle have a special aura that others can intuitively detect. This happens in nearly all of the realms, but in Aysle it’s amped up to a significant degree, and those heroes who play a Glory card in Aysle gain a bonus to persuasion and intimidation. Law of Legends: The arrival of Aysle didn’t just affect Core Earth, but the invaded cosm affected the invader as well. The love of stories of the people of Core Earth have actually created a new World Law in Aysle, on that makes stories part of the reality itself. These Quests, which are based on the myths of Aysle and Core Earth, have a series of requirements and adversities that must be completed. 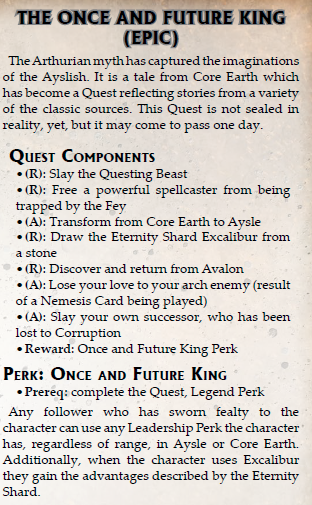 Those who successfully finish a Quest are granted a Legend Perk or an Eternity Shard associated with that Quest. Over the next several weeks we’ll be highlighting different parts of the upcoming products for Aysle including Perks, spells, miracles, threats, and magic items!